I got a chance to speak with Carmella Altobelli, vocalist with the The Ravelles (later known as Sainte Jon’s Academy), a band from Iron Mountain, Michigan who were a popular Midwest touring band in the late sixties. Carmella said the Ravelles were a unique band for the area as they were the only local group at the time featuring a female vocalist. This allowed the band a broader repotoire of songs that included a number of Jefferson Airplane numbers like Somebody to Love and White Rabbit. The Ravelles had a growing number of fans as they toured throughout Wisconsin and the Upper Penninsula. They played at many 18 year old bars in the Green Bay area and in 1968 released a locally made record of an original song, Psychedelic Movement, described by Carmella as “soul-psychedelic”. 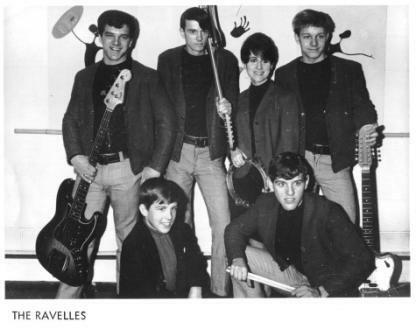 The Ravelles opened for the Cryan Shames and Little Anthony & the Imperials in Marquette, MI and also toured with the Buckinghams around that time. Also got a chance to talk briefly with Ravelles guitarist John Richtig who is still in the music business in Iron Mountain. After the group changed their name to Sainte Jon’s Academy, Madison agent Ken Adamany made an effort to promote their 1969 original song, Smile At the Flowers b/w Why Can’t I Be the One, with Irwin Zucker of Hollywood-based Double Shot records but the song received only some local play. Neither Carmella nor John could remember specifically playing at the Pop House. Do you remember them? 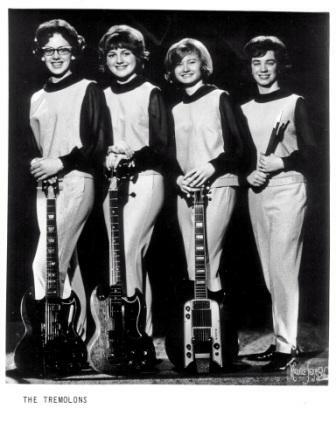 A truly unique band, this all-girl quartet from Niles, Michigan performed from 1963 to 1965. During that time they recorded four songs for Chicago-based Dunwich records: Whole Lotta Shakin’, Heartbreak Hotel, Theme for a DJ, and Please Let Me Know. The first two songs demonstrated the influences on these girls… less the typical girl-group “da-doo-ron-ron” stuff, and more Jerry Lee Lewis and Elvis rockers. The other two songs were originals, written by group leader and guitarist Char Vinnedge. The Tremolons’ sound was described as hard-edged and rockin’. Char and the band changed their name to The Luv’d Ones in 1965. In addition to performing, they wrote and recorded several more songs for Dunwich records before disbanding in 1968. Tremolons and Luv’d Ones recordings are collectible and available on Sundazed Records. Do you remember seeing the Tremolons at the Pop House? March 19th, 2007 at 3:41 pm I do not remember the Tremolons. My Pop House days were from late in 63 to summer of 67. I never missed a Saturday night. March 21st, 2007 at 8:16 am Thanks, Pam. I suspect they never performed at the Pop House. Cool picture though, huh? Soon I hope to post a list of many (not all) bands that performed there. Hope to get comments from you and others when I do. Thanks.